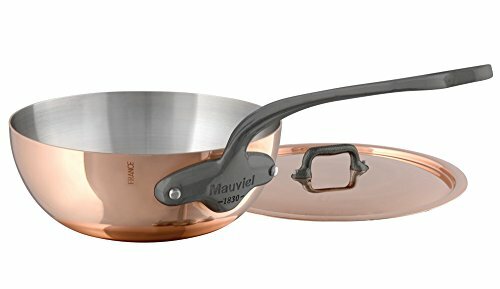 Mauviel, a French family business established in 1830 and located in the Normandy town of Villedieu-les-Poeles, is the foremost manufacturer of professional copper cookware in the world today. Highly regarded in the professional world, with over 170-year of experience, Mauviel offers several different lines of copper cookware to professional chefs and home cooks that appreciate the benefits of their high quality products. Professional cooks can attest that copper cookware is an essential part of every cookware collection as it is 2 by more conductive than aluminum and 10 by more conductive than stainless steel. This advantage makes copper the very best material for cooking, as it is unsurpassed in its ability to heat up evenly and rapidly and to cool down quickly, allowing for maximum control and great cooking results. The M'Heritage collection is a combination of two powerful and traditional materials, COPPER and Stainless Steel. This blend of materials energizes the pleasure of cooking. The COPPER allows for unsurpassed heat conductivity and control, and the STAINLESS STEEL interior is ideal for all daily cooking needs. 90% polished COPPER exterior with 10% 18/10 STAINLESS STEEL interior. Good corrosion resistance. Straight Edge. Stay Cool Cast Stainless Steel handles are fixed with sturdy stainless steel rivets . (Please note-New M'Heritage 150C2 Collection handles have a colored iron finish which are stay cool stainless steel) M'Heritage is resistant to high temperatures and scouring pads on the interior and comes with a limited lifetime warranty. Made in France.